Brain on Fire: My Month of Madness has been one of my favourite recents reads. It is enthralling, fascinating, and moving, as well as brilliantly written; so, of course, I jumped at the chance to see author and New York Post reporter Susannah Cahalan speak about her work and the life-changing experiences which the book details. I reviewed it in January and am still thinking about it. Susannah appeared to have some sort of breakdown at the age of 24, unable to work and behaving strangely. She also had terrifying seizures that resulted in her admission to an epilepsy ward; but it wasn’t epilepsy. Susannah’s bizarre behaviour, delusions, paranoia, lack of motor skills, affected speech and lack of emotions clearly signalled that something else was wrong. After undergoing every test in the book and seeing a number of doctors, she was diagnosed with anti-NMDA-receptor autoimmune encephalitis. Essentially part of her brain was inflamed because her immune system was attacking it, affecting her ability to function, to think and to feel. Susannah’s extreme symptoms made it seem as if she had ‘gone mad’. In fact, at one point doctors thought she had schizoaffective disorder. The research that lead to her diagnosis and treatment, by two amazing doctors, Dr Dalmau and Dr Najjar, could be used to change the way that mental illnesses are diagnosed and treated forever. This is astounding, wonderful, potentially life-changing for so many people. 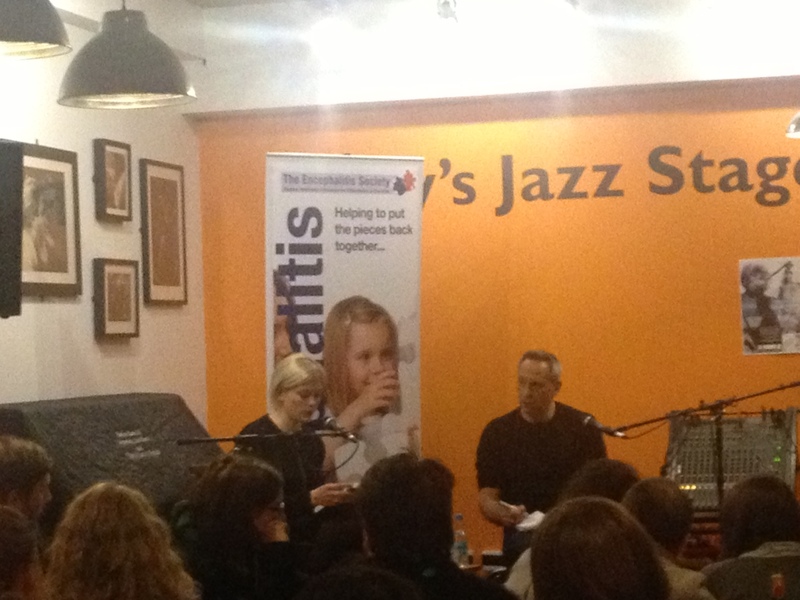 In the Cafe at Foyles, Susannah Cahalan was in conversation with Simon Hattenstone of The Guardian, who suffered from encephalitis as a child. She read from Brain on Fire and gave candid answers to questions and words of thanks from the audience, many of whom had been affected by encephalitis is some way. It is always wonderful to hear a writer talk about their work in person, and Susannah was charming and funny, as well as honest and sincere. It was quite moving to hear fellow encephalitis sufferers share their stories, and many of them talked and exchanged details after the event. The possibilities for the diagnosis and treatment of mental illness added an extra poignancy to the subject matter, and I couldn’t help feel moved. 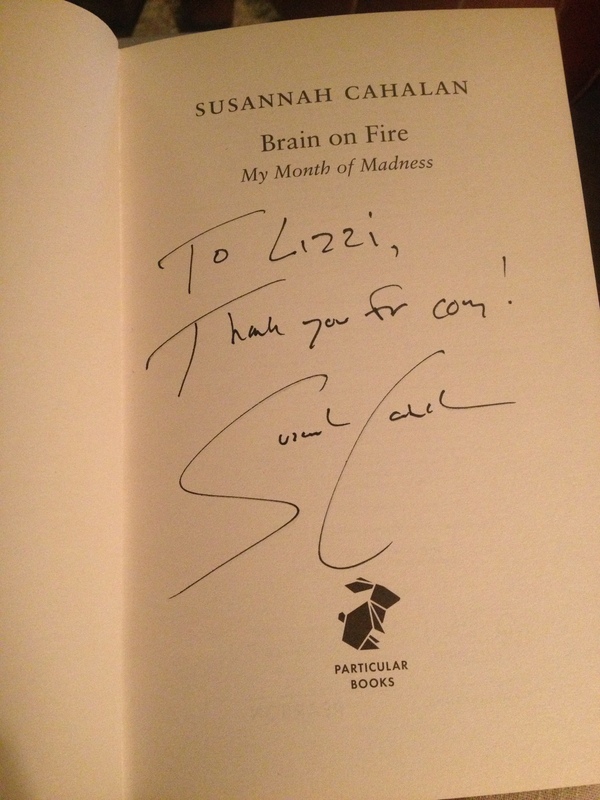 Susannah has been the only writer that I have actually been quite nervous to meet, as well as excited, because I admire her so much. I wished I could have talked to her more about her fantastic book. So glad I got to meet the author of this wonderful book! Huge thanks to Karen Browning at Penguin for telling me about Brain on Fire in the first place, and for inviting me to this event. Click here to hear Susannah discussing her experience and her book on BBC Woman’s Hour from Monday 4th February 2013. Looks like a well practiced signature! What a wonderful opportunity to hear her speak and so great that others are able to share their experiences and be heard too, it’s almost as if this book has spawned a movement, bringing together people struggling with these unknown causes of their change in behaviour. 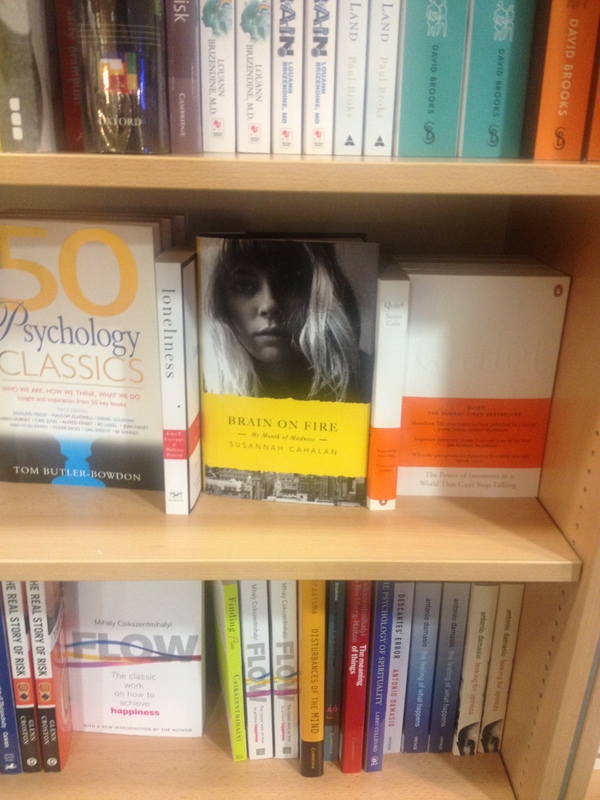 Brain on Fire yes, but she also has brought a strong and necessary light to a previously sombre place. Completely agree. It was quite moving to hear people’s experiences and their gratitude to Susannah for her book. It was very much ‘If she can get better, so can I’. So, so glad I went to this event!